The Danish logistics heavyweight DSV has appointed Carsten Trolle to take over the Air and Sea biz from Jorgen Moller. With this change in management a representative of a new generation will soon take the helm at DSV’s most important business segment. After impressive 42 years with DSV Jorgen Moller will step down from his post and hand over responsibilities as CEO of the Air and Sea Division to 48 year-old Carsten Trolle. This will happen at the end of March 2015. “This long-term planning enables a smooth transition of responsibilities,” comments DSV’s Investor Relations Director Flemming Ole Nielsen. 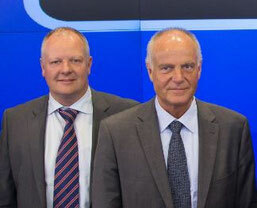 Jorgen joined DSV in connection with the acquisition of DFDS Dan Transport back in 2000. His career with Dan Transport, DFDS and DSV spans 42 long years. During the last 34 years he was based in New Jersey, USA, leading the company’s Air and Sea activities from there. After his retirement next spring, Jorgen will continue his involvement with DSV as an advisor on special projects. Being so many years with the company “Jorgen has helped form the DSV we know today. He has been a key driving force behind the development and growth of the Air & Sea Division and we are very grateful to him for that. At the same time he has managed to build a strong, global management team around him. The Division is therefore in safe hands when the baton is passed on in April to Carsten Trolle, who shares many of the same leadership values as Jorgen Moller. We would like to wish Jorgen Moller and his family all the best for his new journey,” says Jens Bjoern Andersen, CEO. His successor Carsten Trolle has a solid greight forwarding background. Having been with the company for the last 30 years he’s anything but a newcomer or a lateral entrant from other industrial branches. He has been with DSV for 30 years, and since 1991 in the United States where he has held positions as Branch Manager and Vice President. Since 2008 he has been head of DSV Air & Sea USA and later also of the North American activities. Carsten Trolle is a member of the Air & Sea global management team. Like his predecessor Moller he’ll also be based at New Jersey, managing the division’s activities from there. “New Jersey is a very important operational site for our enterprise,” reasons Flemming Ole when asked by CargoForwarder Global why the Air & Sea unit is not based at DSV’s Danish headquarters. The importance of the division is illustrated by figures. According to Flemming Ole 55 to 60 percent of his company’s total earnings are contributed by Air & Sea.